…that this guy looks exactly like Steve Martin to me. ETA: Okay, Alert Readers have pointed out the significance, which is that that actually is Steve Martin. 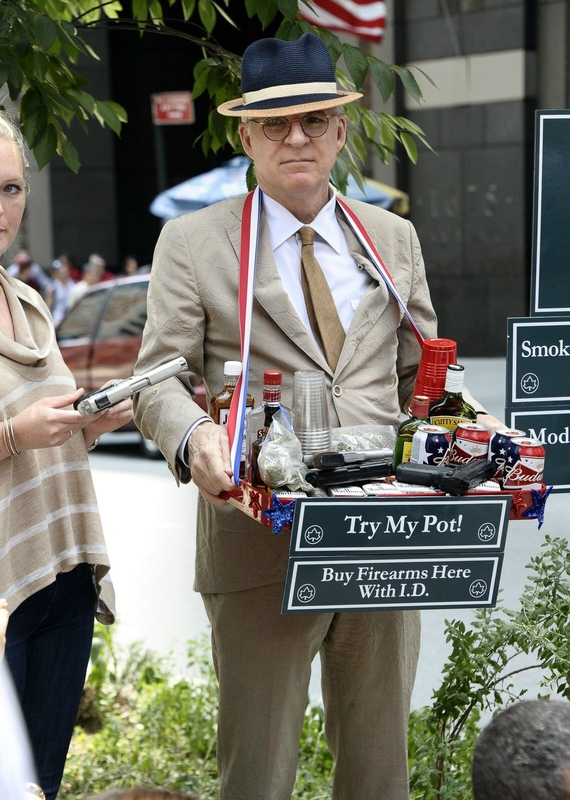 You have to love that he’s apparently selling alcohol, tobacco (close), and firearms at a single source. It’s an ATF one-stop-shop. UHMERICA!!!! Considering that, perhaps it actually IS Martin. I don’t see a banjo, but that’s either Steve Martin or a guy who should be a professional impersonator. Upon reflecting on the fact that it’s apparently in NYC, I believe the firearms have been photoshopped into the picture. Close examination would appear to confirm this. Still, it’s a clever bit of comedy. ID. Definitely an invasion of our privacy. Yet, in the public welfare we need it to vote and contract deals. It is a pendulum swinging. We loose liberties and then gain them back. I don’t much care for mandatory I.D., but I care even less for people voting more than once in any given election, or illegals voting at all, or even being in the country. And I don’t know of any solution to those issues that doesn’t involve some kind of I.D. system. A sufficiently secure border would alleviate the illegal alien problem, but would do nothing about the “vote early, vote often” issue. Not to mention identity theft.